Supporters of Lesotho's Democratic Congress. Opposition Democratic Congress (DC) deputy secretary general, Tlohang Sekhamane, is unfazed by the apparent internal opposition to his bid to take over as party leader and has even set his sights on becoming the next prime minister of Lesotho. Mr Sekhamane also cautioned DC members against electing poor people to leadership positions because "there is a likelihood that they could embezzle party monies". Mr Sekhamane is set to slug it out with deputy leader Mathibeli Mokhothu at the party's conference to choose the successor to long-serving and founding DC leader, Pakalitha Mosisili, at the end of this month. Dr Mosisili also served as Prime Minister from 1998 to 2012 and again from 2015 to 2017. 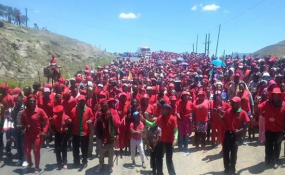 A fortnight ago, DC supporters, who attended the party's rally in Maputsoe, Leribe district, embarrassed Mr Sekhamane when they booed him while he was introducing himself. Some analysts said if the booing was indicative of general dissatisfaction with Mr Sekhamane among the party's rank and file, then it spelt a bad omen for his bid to succeed Dr Mosisili. Party chairperson Motlalentoa Letsosa had asked Mr Sekhamane to introduce himself, along with other national executive committee (NEC) members when the supporters jeered him. The heckling started when Mr Sekhamane received the microphone from Lesotho Congress for Democracy (LCD) committee member, Sethunya Sekoqo, who had attended the rally as a guest. As he attempted to speak, some of the supporters started shouting "sit down, we don't trust you". "We don't like you." The heckling continued until Mr Letsosa called the supporters to order. Mr Sekhamane then laboured through his introduction while the majority of the NEC members looked away before he handed the microphone to his rival, Mr Mokhothu. In a classic case of contrasting fortunes, Mr Mokhothu was met with cheering and chanting. He was even presented and draped with a Linare blanket for "having stood by Ntate (Pakalitha) Mosisili during difficult times". However, Mr Sekhamane remains unfazed and in an interview with the Lesotho Times this week, the former government secretary, foreign and finance minister shrugged off the booing incident. "People may talk about their love for a certain person, but truth be told I have never left the congress movement and have always been loyal to it," he said in reference to the incident in which his rival appeared to get the endorsement of the party faithful at his expense. He said he was confident he would be the next leader of the party as he was the "most qualified member of the DC". He said he was not only a born leader but he deserved to eventually become prime minister because "I have leadership skills and have a vision for the nation as a whole not just my party". "If things were to be weighed objectively, I am the most qualified member of the DC, a Master's degree holder in economics. I have been a congress member for the longest time and I don't think anyone has served longer than I have in the congress movement. "I believe I am eligible and can be the next leader of the DC because I am qualified and am a born leader, I have leadership skills and I have a vision for the nation as a whole not just my party. "Being leader of DC alone is not enough. Actually, this is just a stepping stone to my bigger dream. I want to be the prime minister of Lesotho. "I see the DC as an instrument for the development of the nation and I want to be DC leader because it has a chance of forming the next government. That way my dream of becoming prime minister shall be fulfilled," Mr Sekhamane said. He enunciated the qualities a leader should possess, saying among other things, the successful candidate should be one who had the necessary resources to run a well-oiled campaign. He said poor people should not be voted into leadership positions because there was a risk that they could use the positions to misappropriate funds to enrich themselves. "A leader should be someone who has convinced the followers that they have qualities and have money to run their own campaigns. "A poor person should not be elected because there is likelihood that they could embezzle party monies. If one doesn't have money to run their campaign they should just sit down and let those who have it run the show. "The leader should also be someone with international exposure, who is eloquent in both Sesotho and English." Mr Sekhamane cited his long working relationship with Dr Mosisili at both party and government levels among the reasons why he was the natural successor to the latter. "We may all be contestants but I am the one with the most experience. I worked under the direct supervision of Ntate Mosisili from 2000 to 2017 and no other candidate ever worked that long with him. I know him (Dr Mosisili) like the back of my hand, his strengths and his shortcomings, thus I have learnt a lot from him. "I am the one who implemented the free primary education system (as principal secretary in the Ministry of Education in 2000) in fulfilment of Ntate Mosisili's dream. I also saw to the success of the school feeding programme. I am the best remembered government secretary after I succeeded Ntate Mohlabi Tsekoa who excelled at what he did. I had big shoes to fill and I didn't disappoint. "I established the business council to enhance cooperation among the business sector, the prime minister and the cabinet ministers. I am the first and last Mosotho to be president of the African Association for Public Administration and Management (AAPAM) representing the whole of Africa." He said if elected, the first thing he would do was to change the governance structures of the DC and establish various committees to deal with various issues. "As of now the national executive committee (NEC) is running everything. I will put in place different committees to deal with issues that need to be addressed. For instance, there would be a conflict resolutions committee, an income generation committee, propaganda committee, law and legal affairs committee, industrial development committee and a policy committee. "I will also put in place ad hoc committees when the need arises and these will be dismantled after they have finished their tasks. "Establishing such committees will not only get the job done but also help everyone get exposure and the needed experience in the running of the party. This way the NEC would only need to meet once in three months because the party business will be allocated to the relevant committees." On the national leadership, he said a prime minister should only serve for two terms as this was long enough for them to implement their developmental vision for the country. "Every leader should be able to fulfil their vision within two terms and failing to do so, they should just go. "The main problem that is holding this country back in terms of development is the lack of accountability. We need to be accountable as political parties... . to make the government accountable as well. "But if a leader stays in power for too long they will no longer see the need to be accountable." He said Lesotho was blighted by high levels of poverty and unemployment which had resulted in high rates of divorce. "If only those in power could help solve the problem of poverty instead of worsening it by promising youths jobs which they fail to deliver, then we would be a better country." He said in the event that he became premier, his first task would be to tackle the scourge of corruption as it negatively affected socio-economic development. "As prime minister, I would eradicate corruption within five years of being in power. The day I take over, anyone who engages in corruption shall have a long jail term. "Corruption is the diametrical opposite of development and severe deterrent sentences would have to be put in place for those who engage in corruption. I would also consider giving incentives to those who report corruption," Mr Sekhamane said.